In readying my fingers for this post, I had only one thought, “Find a Madeleine L’Engle quote.” She is right next to C.S. Lewis as one of my favorite authors. Her book, A Wrinkle In Time, is my favorite book, going back all the way to fourth grade. It wasn’t the very first book that I had purchased at a book fair, even though I had not bought very many. Buying books takes money, and money was in short supply in those days. A Wrinkle In Time was a book that interested me in a way that the Star Wars: Return of the Jedi activity books did not. The first cover I ever saw for A Wrinkle In Time. On the cover, there was a flying centaur-like creature, and a mysterious face with red eyes. The entire color palette of dark-neutrals and slate grays captivated my imagination. I purchased the book with the few dollars I was given, and I began reading immediately. I read through page 100 or so before I realized that I had read this before – not the book, but the section. I flipped back a few pages, and then a few more. There was a section in the center of the book that repeated a previous section. It was a misprint. I was shocked and terribly disappointed. I had spent good money on a book that was broken. Now I didn’t know what would happen in the middle of the story. I found the place where the repeated section ended, and I continued reading. I finished the book, and then I immediately checked out another copy of the book from the school library and flipped to the section that I missed. I finished the book, and I was satisfied. That book had a lasting effect on me. It was the first book I read that was not perfect. I had no idea that such a thing was even possible. I learned through experience traumatic to me that some things that we take for granted are subject to human error. This book has the distinction of opening my eyes to imperfection. I’m certain I had plenty of other opportunities to see things gone wrong, but this one was all mine. I had lived in a world filled with books. Each one had a complete story. Each one was perfect – not just in its own way, but in all ways that I could see. Each one was complete and whole…until this one. The simple misprint troubled me. It troubled me more than I wanted to admit. I had spent good money on this book, and now the book fair was over, and there was no way that I could get my money back. Even if I had gotten my money back, it was – in some ways – the end of my world. I had never had to leave a story like this before. I had never seen a book that was broken when it was new. Fast-forward quite a few years to today. I am an author. I realize my own imperfections. In my writer friends, and their budding works-in-progress that they entrusted to me as a test reader, I see imperfection. I look further to see what is beneath that imperfection. What causes a writer to write? Or an artist to make art? Or a musician to make music? What causes us to do what we do in the pursuit of truth? 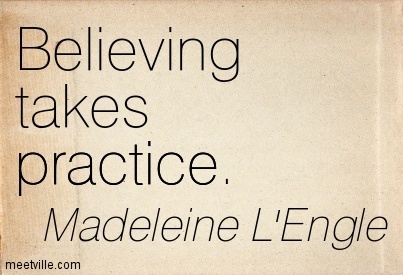 Believing takes practice. So said Madeleine L’Engle. 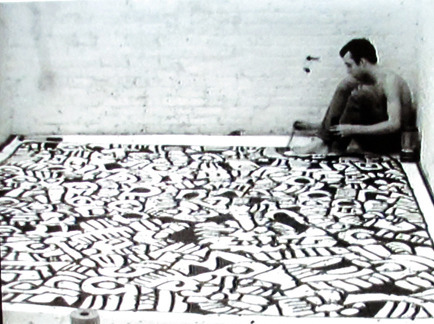 So say I. I seek after perfection – all artists do it, to varying degrees. However, it is not perfection that is achieved. It is, rather, a string of failures – a patchwork of persistence – that combine together to create a version of truth singular to its creator, author, artist, musician, or organizer. Belief that the story needs to be told, the truth needs to find a face, and the image needs to find a voice – and then realizing that I am the imperfect tool that this story needs to find its way into the world – that takes a lot of faith. Believing takes practice. Each one of us has something to do each day. Each one of us will have thoughts that come into our mind of things that we should do in the course of our daily work, whatever it may be. Give room to let those thoughts through. Now substitute whatever thoughts might come to you for the term “book” in this final quote. So where do we go from here? I speak these works that I, myself, need to hear. Believe in yourself, in your work, in the truth. Despite imperfections in the instruments of its creation, truth wants to be heard. There is no one that sees things exactly like you. There is no one that can do exactly what you do. So each day becomes a process of working, listening, adjusting, collaborating, and moving forward. In short, believing. Believing takes work. Is there something you’ve been waiting to do because you haven’t believed enough? Are there thoughts pointing you to do or say something that you have pushed aside? What is your story, and how can today make it better? Share in the comments below. This post appeared under the title “Believing, Despite Imperfection” on TarlAndAimee.blogspot.com on August 24, 2015, written by the same author. 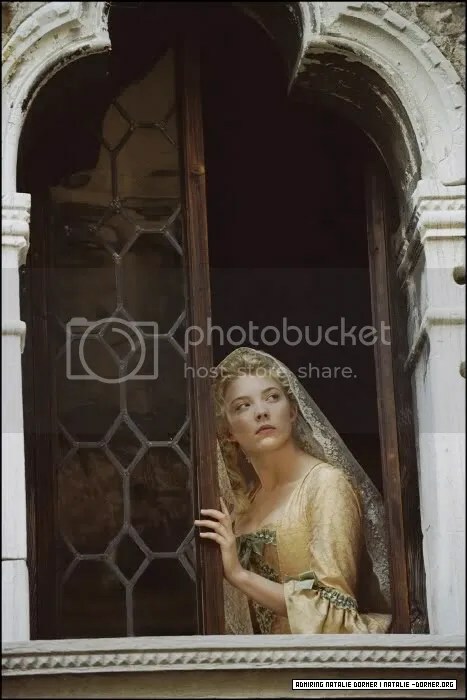 Do your characters hide when you come knocking at the door? Try asking these questions instead to get to know them better. We’ve all been through the get-to-know-you stage in meeting new people. Whether it is at work, or at school, or just moving to a new place, getting to know new people is difficult. It is made more difficult by the walls erected to keep our own personality and quirks obscured. Each person has their own walls around their persona, and they only let trusted people get to know the “real person” inside. How do you get to truly know a person? You ask the deeper, thoughtful questions beyond name, job, school, sports teams, movies, etc. One suggested question for getting inside a person’s head might be: What is your most treasured possession? Or, How would you like to die? However, you must be careful with such emotionally-charged queries, and use these questions with discretion, as they may be greeted with suspicion (or restraining orders) by one unfamiliar with your get-to-know-you questions. Painted into a corner via Google image search. With the recent republishing of Books One and Two in The Hidden History of Oz series, I want to share a few things that have been added to each title. Each book contains an Appendix, which contains several important pieces of information for the dedicated reader. The Characters (referred to as The Players, a nod to Shakespeare). I have received comments on this addition. When a reader can’t keep all of the characters straight in her head, it is helpful to have a reference list. Timeline. There is a lot of history referenced in each story. The timeline section details the events that happened and those referred to in the context of the novel. Maps (where applicable). I like epic fantasy novels that include maps. It gives me a sense of wonder at the fantasy world. Locations. There are some new places mentioned and visited in the context of each story. Just like the character list, having a list of the locations helps the reader remember. Plus, it will help when the inevitable wiki appears. Guide for Parents. What makes my stories different? I claim that they are good for ages 10 and up. How does the parent know what is in the book, and if he or she wants their child reading this story? What can the parent talk about with the child? (This would work for reading groups also.) The Guide for Parents is also available on this website, for on-screen viewing or as a downloadable PDF. See the menu bar above. Then there are the standard pages with the Author Bio, On the Web, Other Books by Author, but those are pretty standard in published novels anymore. This Appendix is a labor of love from me, the author, to you, the reader. I want to show you that each story means something special in the greater world. I’m not going to give you the moral of the story, or tell you what to believe, but I am giving you the facts, and you can dream as you may. 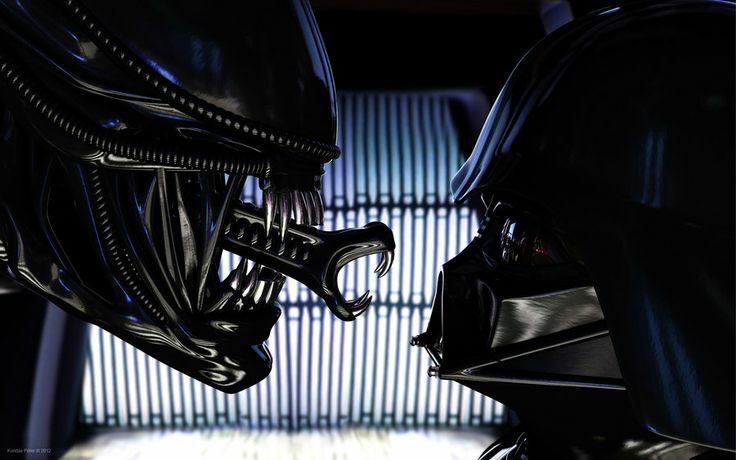 Alien vs. Darth Vader. Image courtesy TheForce.net discussion boards. A good villain is the embodiment of that which makes you feel helpless.